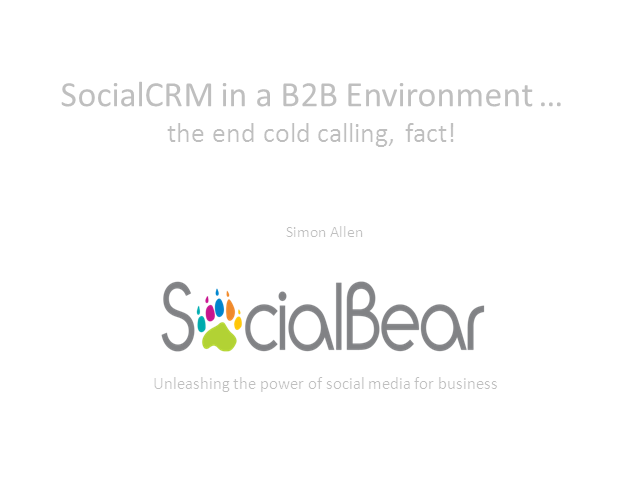 Social CRM in a B2B Environment - the end to cold calling, fact! We start by touching on some fascinating statistics in circulation and the future of Social CRM. Then we will take a step into the future of Social - SocialCRM and get to grips with why it will transform marketing for the wider good of all. We close with a question: if not now, when? With over twenty-five years in marketing, management and technology, Simon has a wealth of experience and pragmatism to call upon. He studied business, management and technology at the UEA and holds a Master's degree in Business Administration. He formerly lectured Marketing Communications at Diploma level and is a Fellow of the British Computer Society. Title: Social CRM in a B2B Environment - the end to cold calling, fact!